The Drenai world has become very large and developed over the course of the nine novels. Here, we have an attempt to sort out some of that world and make a map! Ok, the lands of Vagria and Gothir are still in question. As there have never been any real good descriptions of the Vagrian lands, it is really hard to shape the land. I think that I have not given the Gothir people enough land to the north, ad this will be revised with the second drawing of the map. Skulitik forest is described as 1000's of squre miles in Waylander. I am not sure that I have the area it covers in this map shown enough. I believe that I have placed too much distance between the end of the Skeln mountains and Dros Purdol. I believe that there is less of a gap. Ventria!!! Placing this country is easy, it is in the east. However, is it connected to the Drenai lands? I can't say. In The First Cronicles of Druss the Legend, it mentioned a farmer that moved from the Sentran Plain to the Ventrian Border. Being a Drenai farmer, I don't recon that they would stray too far form Drenai lands, especially as they moved to the Skoda mountains after their farm failed. 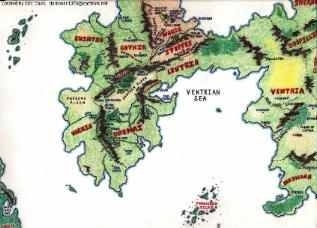 Also in Waylander, the Legon riders under Gellan reconned that they could head north through Delnoch and then head east to the lands of Ventria. So from those few quotes, it seems that the border with the Drenai lands and the Ventrian lands does infact exist, or there is a selection of "nomad" lands inbetween. ????!!!! Other people on the internet have also created Drenai maps. I have only found two sites which include a good map of the Drenai world. The two have been linked below to their respective sites. I must say that I do not agree with some of the placing of cities and features. However, I am not slating the maps or saying they are wrong. Over my investigation of the books, I have come across several differences between descriptions of areas. Because of this, I have put together a database of quotes from the books. They show different references to the features of the world, and so, if questioned about the map, or history of the world I am compiling, I can referer to the books themselves easily! Many thanks to Eric Davis for allowing me to show his map on this site. 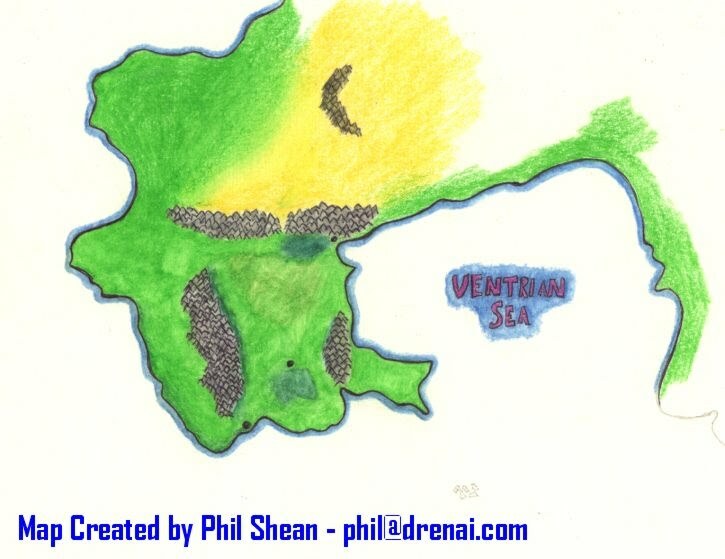 Dale Rippke has also put together a map of the drenai world, available here.